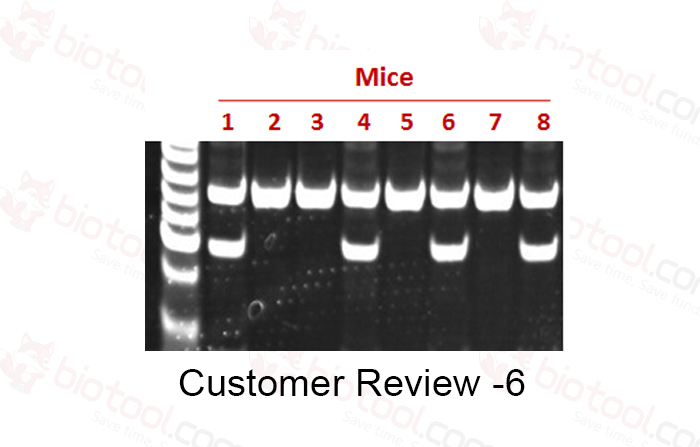 The Mouse Direct PCR Kit provides a fast preparation and PCRamplification that is specifically designed for mouse genotyping. TheBuffer L and Protease Plus rapidly digest mouse tail, ear and toe torelease intact genomic DNA that can be used directly as the templatefor PCR amplification.By using this kit, the digestion process only takes 15 minutes. 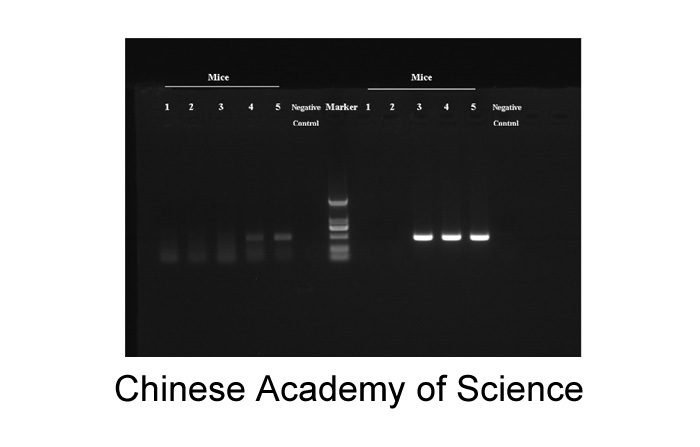 In addition, the 2x M-PCR OPTI Mix(which includes an optimized Taq Polymerase) ensures highamplification efficiency of target DNA. 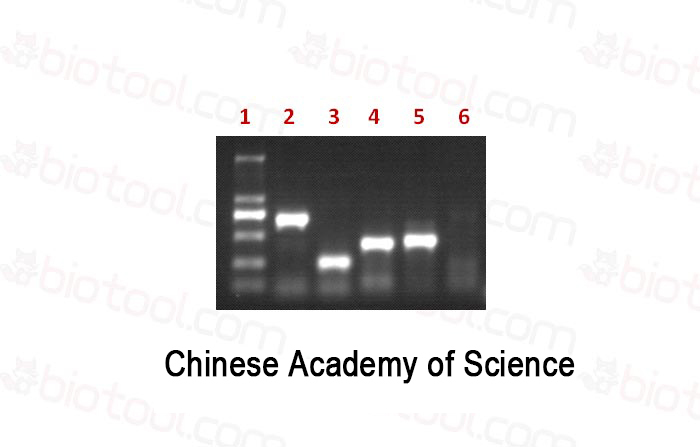 Lane 1-10 represents different PCR primers. 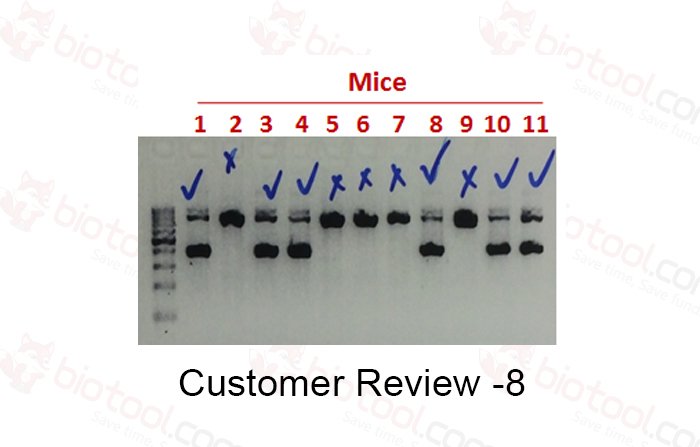 Two of them serve as the negative controls (Lane 9 and 10) which only display bands when using the transgenic mouse sample. 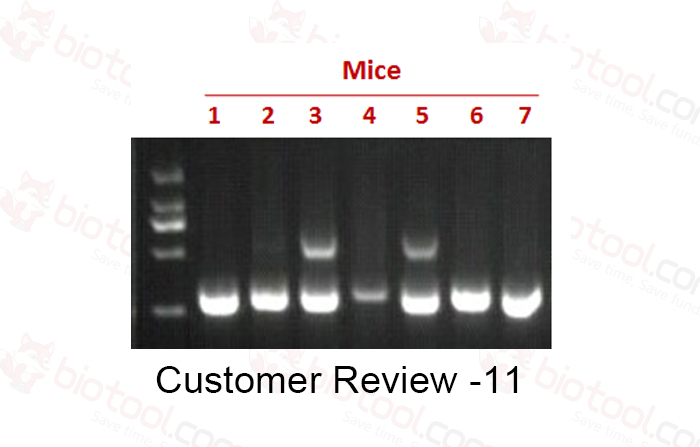 Therefore, Mouse Direct PCR kit ensures a higher PCR specificity, making it a reliable product for scientific research. 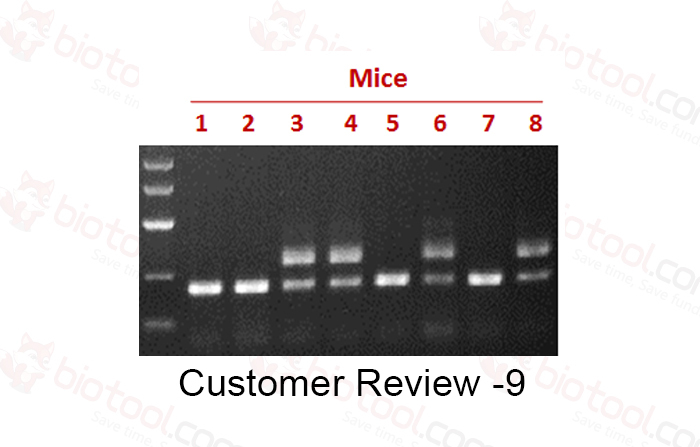 The Mouse Direct PCR Kit applies to the preparation for samples from mouse tail, ear and toe. No significant difference was observed between the groups, which, digests in 55℃ for 15 min or 30 min. The kit is also effective for the amplification of large fragments (e.g. 3Kb). 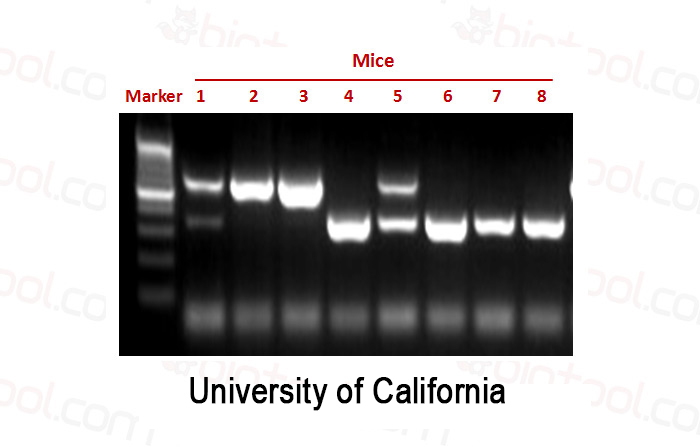 Note: The primers for amplification of 500bp and 3Kb-fragments is designed based on the mouse GAPDH gene, while the primers for 1Kb and 2Kb-fragments is designed based on the mouse Ppip5k2 gene. Protease Plus: For rapid and efficient digestion of mouse tissue in only 15 minutes! 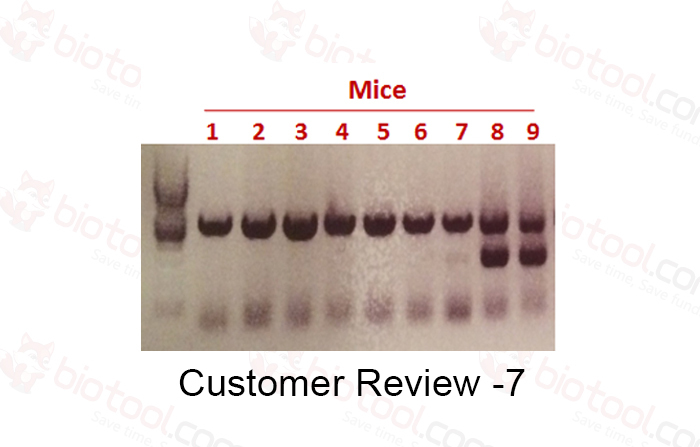 2 x M-PCR OPTI™ Mix: Includes Bimake's trademarked and optimized Taq DNA polymerase, dNTPs, MgCl2, and reaction buffer. 2 x M-PCR OPTI™ Mix and Protease Plus should be stored at -20°C for 2 years. If the PCR Mix is to be used frequently, it can be stored at 4°C for up to 10 days. Buffer L should be stored at 4°C. Place the mouse tail, ear, or toe in a 1.5 mL centrifuge tube. Thoroughly mix 100 μL of fresh Buffer L with 2 μL of Protease Plus for a single sample in a separate tube. Add the protease mixture to the mouse tissue tubes with the tissue cut submerged in it, then incubate at 55°C for 15 minutes. After the digestion process, incubate at 95°C for 5 minutes to inactivate protease. 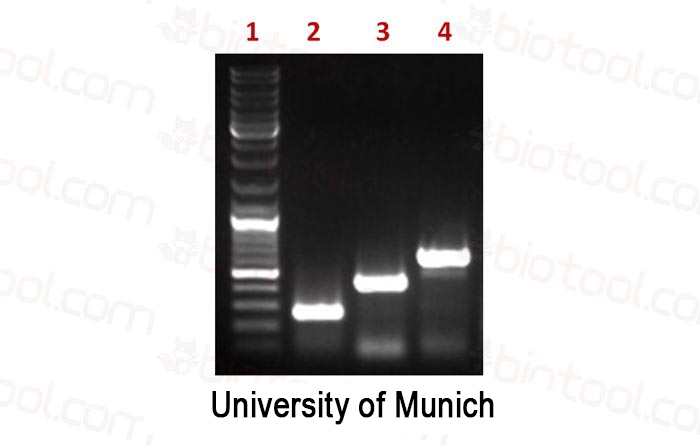 The tissue lysate can now be used as a PCR template. 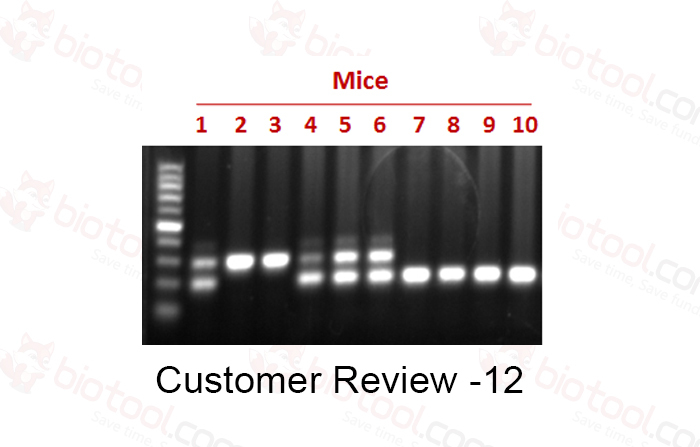 Add dd H2O, primers, template, and 2 x M-PCR OPTI™ Mix into a PCR tube according to the recommended concentrations. Give the mixture a quick spin in the centrifuge and load into PCR amplifier to begin amplification. 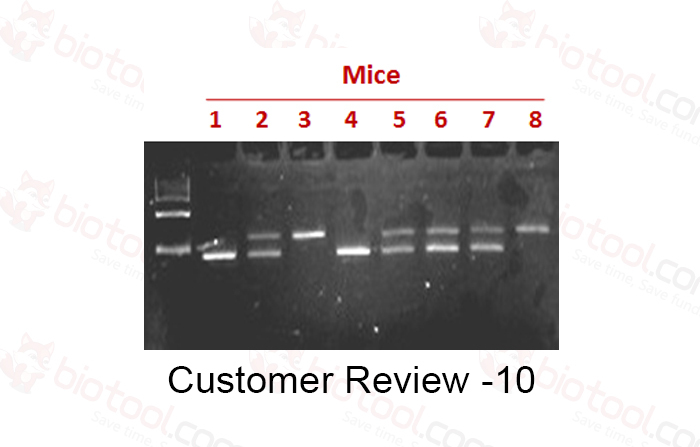 It is recommended to prepare PCR reaction in ice-bath. 1. All reagents in this kit have been optimized for use together and any modifications or alternative uses are prohibited. 2. For each step, make sure every reagent in the kit is blended well prior to use. 3. During the tissue digestion step, shaking the tubes 1-2 times will be helpful to release the genomic DNA. 4. 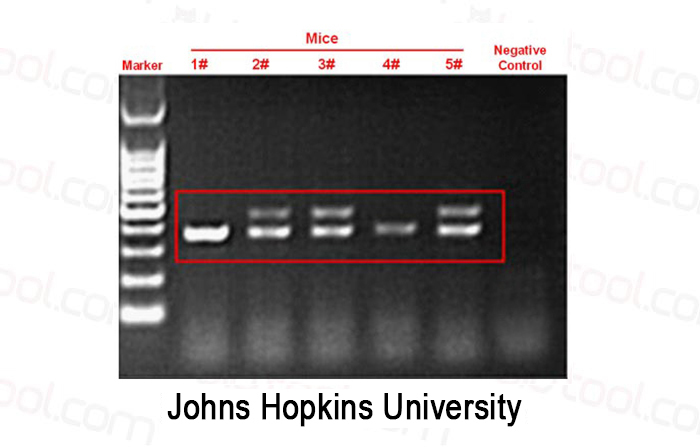 For most mouse tissue samples, an incubation of 15 minutes at 55°C will suffice for genomic DNA extraction. The tissue may still appear intact, but extraction has occurred. 5. 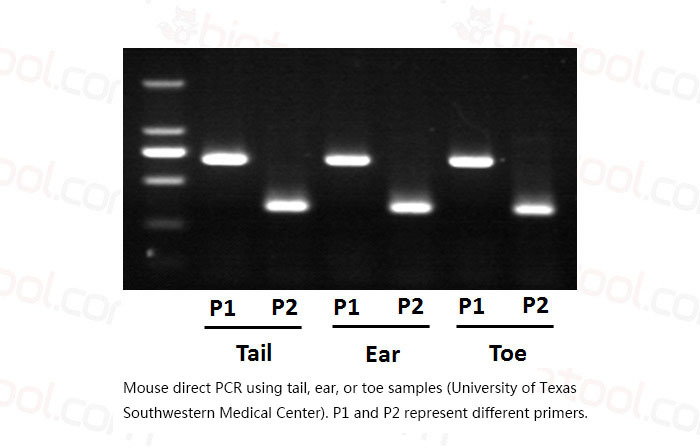 The extracted mouse genomic DNA should be applied immediately prior to the PCR amplification step. Inappropriate long-term storage may cause unreliable PCR amplifications. Please review the following for trouble-shooting options when you encounter technical difficulties. Alternatively, feel free to contact Bimake technical support directly.